2. Place the milk chocolate chips in a microwave-safe bowl and the white chocolate chips in another bowl. 3. 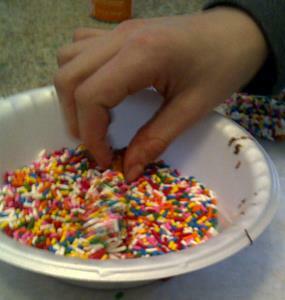 Put sprinkles and candies in a shallow bowl or baking pan. 4. Microwave one bowl on high for one-minute. Remove and stir with a rubber spatula. The chips should melt while you are stirring, but if they don’t, you can continue to microwave for 15 more seconds, then stir again. 5. 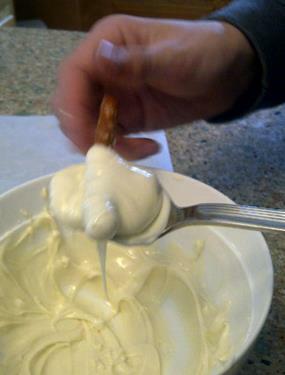 Dip one pretzel rod into the milk chocolate using a spoon to spread the chocolate halfway up the rod. Twist the rod to let the excess chocolate drip off. 6. 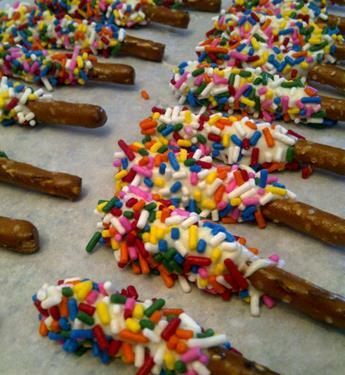 Roll the pretzel in the sprinkles. Place the pretzel on a piece of wax paper to dry. 7. Once you have used up the milk chocolate repeat the process with the white chocolate chips. 8. Let the pretzels dry several hours before wrapping them to give as gifts. My mother’s recipe box and photos by Stephanie Felzenberg.